These item numbers are for artificial teeth attached to various materials mainly acrylic resin. For greater strength metal alloy castings can also be used. These teeth replacement appliances ARE REMOVABLE. To reduce the incidence of decay, gum problems and fungal infections they should be removed at night. If not cleaned properly tartar will accumulate on them. Unfortunately the bone, teeth and gums do change over time, which means dentures may have to be modified or even replaced to reflect those changes. Ill-fitting dentures can damage the mouth and cause chewing problems. Again with health funds there is generally 12 months waiting period after joining. Also not all levels of insurance include cover for dentures. Let’s face it, not everyone needs the cover, but accidents do happen and people do neglect their teeth so over time, denture may be needed. Planning of the required treatment is essential. Anyway let’s go to the numbers! This is a full upper denture that covers the whole palate and is held in the mouth by suction as a seal is obtained by the coverage of the mouth. It replaces all the missing the teeth and gums of the upper jaw. A full lower denture that replaces all the lower teeth and their gums and it covers the top of the ridge of the mandible. It is the probably the worst dental appliance to get used to. It hardly has suction to hold itself in and relies on the person’s muscles and bite to seat it in the mouth when chewing. Implants were first designed to hold lower full dentures in the mouth. The issue with lower full dentures is the lack of bone. When teeth are lost the bone supporting the teeth is longer needed and the body over time removes this bone. The ridge reduces in height and becomes flat making it very difficult it hold the denture. With age muscle tone reduces and the person control over keeping the denture in place can become difficult. Bone is a reducing commodity with time. If teeth are removed due to gum disease the bone loss is greater and reduces quicker over time than those lost due to decay. We even save some root-stumps with root canal treatments to maintain the bone around it. The denture can sit over these roots to help stop movement of the denture. The other advantage of this treatment is that teeth have pressure sensors around the root, so you can still feel how hard you are biting. This feed back to the brain is lost with the tooth removal. Implants have now helped hold denture in. These range from mini-implants to full implants with various attachments. A metal cast section placed within the denture. In the upper denture full denture a metal plate section is used to reinforce a denture that has a history of cracking especially in the midline. This is a removable upper denture base where there are remaining teeth. This item number is for the plastic super structure before teeth and other attachments are added. Item numbers for teeth and retainers, rests and other components need to be added. The plastic material can be an acrylic which is solid or a flexible resin (on brand name is Valplast) which bends and does not crack. The choice of material and design depends on a variety of factors such the position and health of the remaining teeth, the bite, the appearance of retainers (or clips) when smiling and so on. The dentist often has to take study models (item 071) to work out what design to do. Sometimes slightly altering the shape of remaining teeth may make it better to hold the denture. Resin based dentures are easier to modify, repair and even add teeth to it, if there are further extractions. IT IS ALWAYS IMPORTANT TO LEAVE DENTURES OUT AT NIGHT AS DECAY AND GUM PROBLEMS CAN OCCUR WHERE THE DENTURE LIES AGAINST THE TEETH. As for 721 but for the lower jaw. As for 721 but a cast metal frame work is used to place some resin to hold the teeth. Item numbers for teeth and retainers, rests and other components need to be added. The cast metal is a precise fit around the remaining teeth and onto the gums. The added components are part of the casting. 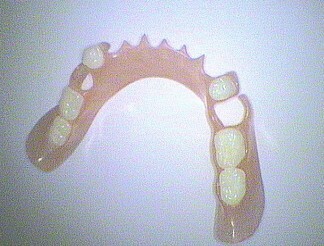 This denture type is difficult to modify and add teeth later. It is best used in a mouth that has very healthy teeth. If there is any doubt then a resin denture is best. 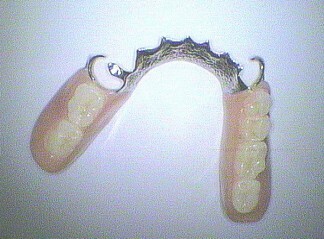 This is an attachment to help hold the denture to the tooth. It is usually a metal clasp around a tooth. There is tooth coloured coated clasps in areas that are noticed when smiling. A component of a partial denture that rests on a tooth surface to provide support for the denture. This generally stops the denture pushing into the gums on biting. An extension over an entire tooth, or an intentionally retained root stump. This is often used to improve the bite or to preserve the bone around a root stump as mentioned above in item no. 712.